What Is Your E-Commerce Business Worth? E-commerce businesses are in high demand right now. Investors are looking for new ways to diversify their portfolios and purchasing an online business is a good way to do so. The market has shown that e-commerce is not going away anytime soon and instead is growing to become a solid option for consumers to purchase goods. Individuals and companies seeking these investment opportunities are paying attention. What does that mean for you? It means that you could possibly own an asset that people want very much, but first you have to know what the value is. Investors mainly look at one number to determine an approximate value for your business; annual net revenue (or profit). 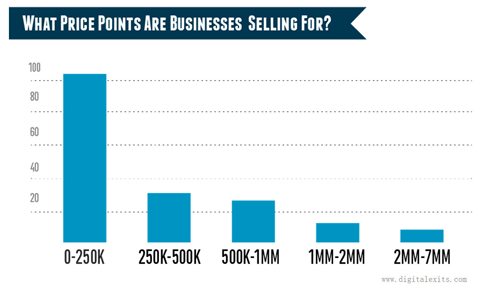 How much profit does your business make each year? Is that number growing or declining? Is there potential to grow that more by adding new products or marketing to a different type of customer? How long will it take me to get my money back? These are the questions running through a buyer's mind when they are considering the purchase of your e-commerce business. A study of the sale of 151 e-commerce businesses in 2013 revealed the average multiple was 2.62 of the annual net revenue. Further, the average final price for over 90 percent of the e-commerce businessed was $250K and under. You can use the 2.62 average to calculate the approximate value of your business, but there are several factors that can cause a sale to increase or decrease from that multiple. Other factors that affect the sale include: profit (growth or decline), how automated the business is, the market(s), the product(s), brand, the diversification of your customer acquisition initiatives, intellectual property, competitors and the overall business model among others. Smaller Businesses (less than $100K in net income) - Meaning you probably making anywhere from $100 - $4,000 in monthly profit. Medium Businesses ($100K- $5 Million) - Your net income is probably around $5K - 200K per month or $50K - $2M a year in profit. Large Businesses ($5M +) - More than $2M in net profit or earnings before interest, taxes, depreciation, and amortization (EBITDA) is usually a target for a merger or acquisition. Higher Selling Price - This give you room to negotiate, but be careful setting too high as it could scare off potential buyers when you get into the 5-10 times multiple. Seller Financing - You will accept a portion of the sale upfront from the qualified buyer and the rest you will take in payments over a time period. Interest is usually added to the terms. Using a Broker - Brokers have extensive networks of qualified potential buyers you can use to sell your e-commerce business. A broker can work with you to find the best valuation for your business before you sell. Sell when it’s Hot! - Finally, one of the most important factors is to sell when your e-commerce business is doing well and growing. If your market is trending and you have a good boost, consider getting the best price while you can. About the Author: Jen Martinson writes for Digital Exits, providing free valuations of e-commerce businesses.